Though it’s barely two years old, the Lumberyard has an old soul and everything that’s necessary for a thriving neighborhood watering hole. The location is a local landmark—it anchors the historical shopping center opposite City Hall. 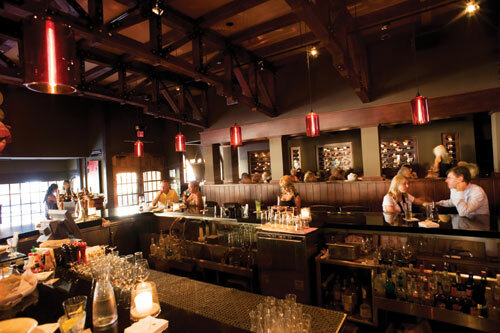 American food and drinks are familiar, priced fairly, and well executed with just enough modernity to keep them fresh. The roomy, nonchalantly fresh digs are so comfy it’s tempting to linger longer, and the chipper staff is so hospitable you probably will. Lumberyard’s predecessor, Cedar Creek Inn, also was a locals’ hang, ultimately weighed down by a threadbare, autopilot mood. The iconic site needed a vitality injection and local industry veteran Cary Redfearn was just the right guy. Operator of bygone Oysters and Oceans 33, Redfearn is now free to concentrate on a single shop, and the attention shows. He and chef Armando Ortega are out to deliver what the townies want. On an abnormally misty Monday evening, Laguna’s village center is eerily quiet. Still, Lumberyard’s booths steadily fill with knots of locals feeding on roasted chicken, pork ribs, and meaty burgers. Many share bottles of wine, while those catching the last minutes of happy hour order cocktails and appetizers at the bar. An easy contentment tempers the room. This feels more like supper than dinner. We’re busy chatting and slow to order, so the patient waitress suggests a bottle of crisp, flowery Argentine torrontés. We submit, if only to buy more talk time. The aromatic white wine is enticing and helps us focus on the menu—a large page of uncomplicated (mostly) American dishes—a familiar territory that Houston’s and the Daily Grill mine so successfully. When the choices include chicken potpie, cedar-plank salmon, and Prime filet with triple-cheese potato gratin, it’s time to calibrate the palate for cooking that is blatantly unfussy. Crispy lobster-and-shrimp spring rolls seem like a promising appetizer to share, given the white wine we’re pouring, but it’s a dud. Blistering hot and markedly greasy, the amber morsels’ filling is bland and texture-free. Dipping sauce can’t save these fry babies. Fresh pear and arugula salad is so much better—walnuts, fennel slices, and blue cheese nuggets adding high notes to greens glistening from a light-handed drizzle of vinaigrette. The rosy, orange king salmon fillet picks up a whisper of wood smoke from roasting on a cedar plank, and a soy-mustard glaze seals in moisture as it shellacs the rich fish. Yukon Gold spuds riddled with smoky applewood bacon are the agreeable side starch. Half a rotisserie chicken is dark brown with a nubby spice rub that fills the booth with a splendid eddy of scents. The juicy bird nestles against fresh-tasting mashed potatoes splashed with an herb-rich jus. Both entrees are simple and satisfying. Bar bites and comfort grub reign supreme during another foray. Panko-breaded fried zucchini stands up well to lemony aioli. Pork sliders—a miniversion of the barbecue pulled-pork sandwich—are tangy, moist, and filling. Blazing-hot sweet potato fries hold their crunch. And signature martinis featuring citrus—the City Hall, and Gregg Abel, named for the remodel’s architect—are commendably constructed and complement the rich snacks. Roasted ruby and golden beet salad with dewy goat cheese is, again, judiciously dressed to show off the sweet beets and tart, satiny cheese on a bed of dark, peppery greens. A mighty slab of moist, finely textured bacon-wrapped meatloaf is packed with gutsy flavors, tempered by the loaf’s delicate texture. Peaks of fluffy whipped potatoes share the strapping gravy of mushroom demi-glace. This meatloaf begs to be in a sandwich, and I’m told it is, on occasion, a lunch special. Pan-seared Alaskan halibut is moist, mild, and bright white inside its golden edges; it’s first rate against a gentle tomato-ginger salsa. Tender pea and asparagus risotto is better than what some Italian places stir up, so the kitchen earns extra points for that. Like everything else here, the signature burger is portioned for a lumberjack. But the huge beef patty tastes dry and comes topped with a big tasteless bun that overrules meager toppings of blue and Swiss cheeses, onions, and bacon. The whole shebang crumbles on the third bite. A juicier version of medium rare would help—how much, I’m not sure. At least the slender fries are a golden pile of crunchy pleasure. The tourists return to Laguna Beach more reliably than swallows to San Juan Capistrano, and this menu is sure to attract that flock. But that migration is fleeting, and Redfearn wisely plays the good neighbor by taking noble care of a beloved site, offering a genial lair for gathering and feeding the natives familiar flavors that taste like a bottomless serving of welcome. Zucchini planks, sweet potato fries, rotisserie chicken, meatloaf, pan-seared halibut, pulled-pork sandwich, Death by Chocolate dessert cocktail. Lunch, $6 to $19; dinner, $6 to $33; brunch, $12 to $19. No. 101 in “Joe’s office”—a 1916 alcove named for Laguna Lumber Co. founder Joe Jahraus. Monday through Friday, 3:30 to 6:30 p.m. Appetizers, $5; wine, $6; draft beer, $4. Local artists design the labels for Lumberyard chardonnay and syrah, both by Bryan Babcock of the Central Coast’s Babcock Vineyards. Also, ask about the off-menu $10 lunch deals. This article originally appeared in the October 2010 issue of Orange Coast magazine.